I played around with the idea for this suspense story a few years ago, but never went any further with it. Now I’m working on it again. Marti rubbed her arms, trying to relieve her cold shivering. Walking across the room she stared out at the dark street. There was a storm brewing. She could feel it. Fear caused her trembling to increase, but she knew it wasn’t the storm. The dark outline of a man still stood in the shadow of the streetlight. She’d hoped it was her imagination, but it was Daniel. She could feel it as strongly as she could sense the storm coming. Why was he just standing there? Why not make his move? Going to the desk across the room, she removed the loaded pistol from the top drawer. She’d loaded the gun earlier, but checked it again. Her hands shook causing her to almost drop it. The sound of thunder rumbled sullenly and the wind picked up, rattling the old, loose shutter she’d put off fixing. It was too late now, just as it was too late to run. Besides she was sick of running, sick of constantly looking over her shoulder. She’d end it tonight. Come on, Daniel. What are you waiting for? Come for me. She looked out the window again. The leaves on the trees danced crazily in the wind. He was gone. Dread moved its icy fingers down her spine. She listened intently, blocking out the sounds of the coming storm. She tried to control the trembling in her limbs. She needed to stay calm. She’d only get one chance and if she missed…she couldn’t even think that way. She wouldn’t miss. She’d already checked the locks on the doors and windows, but knew they offered little protection. Daniel wasn’t one for dramatic entrances and knocking down doors or breaking windows was beneath him. He’d find a quiet way to enter and then he’d just be there. Marty moved away from the window, slowly backing into the far corner of the room. He’d not come up behind her this time. Holding the pistol out in front of her with one hand, she reached into the pocket of her old gray hoodie with the other and removed the cell phone. She pushed 911 and asked for a patrol car when they answered. “I have an intruder at 810 Walnut Street. Please hurry.” Marty immediately ended the call and took the gun in both hands. The clock on the shelf to her right loudly ticked away the minutes. She had no concept of how much time had passed. The storm continued to grow stronger, but she tried to ignore it and concentrate on any small noise she might hear inside the house. Her arms tired and began to ache. She’d not be able to hold them steady much longer. Categories: blogging, novel excerpts, Novel Writing, writing | Tags: blog novel, blogging, E. G. Parsons, elizabeth melton parsons, fiction, New Novels, novel excerpt, Novel Writing, writing | Permalink. 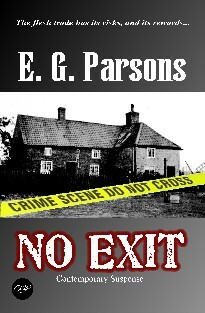 A knot of dread tightened Rachel’s stomach, as she walked through the front door of Murphy’s General Store. She hesitated, took a breath for courage and reminded herself again that she was doing the right thing. The only thing she could do under the circumstances. Seeing that Mrs. Murphy was busy helping another customer, Rachel walked to the dry goods section and began to look through the dress goods. She thumbed through the pretty cloth, stopping at the beautiful sapphire silk. It reminded her of a cloudless summer day and she knew it would go well with her blue eyes and dark hair. Sadness gripped her heart. If Charles were there, she knew he’d insist on her getting a dress length of the blue. Poor Charles—her leaving would hurt him, but she wouldn’t change her mind. Turning from the lovely cloth, she approached the counter to give Mrs. Murphy her order, and hoped the woman wouldn’t ask too many questions. Rachel swayed and clutched the counter, as a wave of dizziness swamped her. “I was telling you about the drifter. They say there’s to be a hanging. Isn’t that just horrible?” From the glee in her voice it was clear she was more excited than horrified at the prospect of a lynching. “Yes, I’m fine.” Rachel swallowed hard and fought back nausea. Feeling positive Mrs. Murphy hadn’t missed a chance to tell the story to everyone who’d entered the store that morning. Rachel counted out the money for her order and hurried to the door. Placing the goods in the back of the wagon, she covered them with the canvas so Charles wouldn’t see them. Climbing in, she thanked Mrs. Murphy and drove toward the outskirts of town. When Rachel was sure she wouldn’t be seen, she turned the horses to go around to the back of the jail. Seeing no one about, she rushed to the barred window. Rachel clung to his fingers when he tried to withdraw. “I love you too, more than life and I promise we’ll be together.” She turned and fled to the wagon, tears wetting her pale cheeks. When she returned to the cabin, Rachel gathered what money she had in the house and packed a few clothes. Later she’d put a few more supplies in the wagon. She’d get Thomas out of that jail and the three of them would be a family, as it should be. She hid the small satchel under the bed until she could sneak away later that night. Writing the letter to Charles was the hardest thing she’d ever done. Slipping it under his pillow, she prayed he’d understand and forgive her. When Charles returned from the neighbor’s where he’d gone to help butcher a steer, Rachel began putting supper on the table. He paced the small kitchen mumbling under his breath. “They hung that drifter this afternoon. I tried to stop…Rachel!” Charles caught her before she hit the floor. Laying her on the bed, he wet a cloth with cool water and laid it gently across her forehead. She moaned and tossed. Charles noticed the damp pink stain spreading on the sheet and became frantic. He didn’t want to leave Rachel alone, but there was no one else to send. He’d have to go for Mrs. Hansen. “Rachel, you’re going to be all right, Darlin’.” I’m going for help. Charles paced the floor and prayed, tears blurring his sight. Rachel’s screaming had stopped, but the mournful moans were worse for him to hear. When he finally heard the weak little wail of the baby being born, he rejoiced. The house became silent and he stopped pacing, rushing to the door when the midwife came out. Charles slumped. “And Rachel—Rachel is okay?” He sounded desperate. “Rachel!” Running into the bedroom, he fell on his knees beside the bed. Gathering Rachel’s limp form in his arms, he rocked her, his sobs filling the cabin. He stayed that way until the bedroom darkened with the setting sun and Mrs. Hansen came to the door. “I wanted to give you this. I found it under the pillow.” She passed him the envelope with his name written in Rachel’s hand. Stuffing the envelope inside his shirt, he went out to harness the wagon. He felt stupid, slow—like just waking from a bad dream. Only he knew he’d never awaken from this nightmare. How would he ever live without his beautiful Rachel? Categories: books, novel excerpts, writing | Tags: 99 cent novel on kindle, ghost romance, Historical Romance, novel excerpt, paranormal romance, Winter of the Heart by E. G. Parsons | Permalink.